Thinking about LASIK and still have questions? 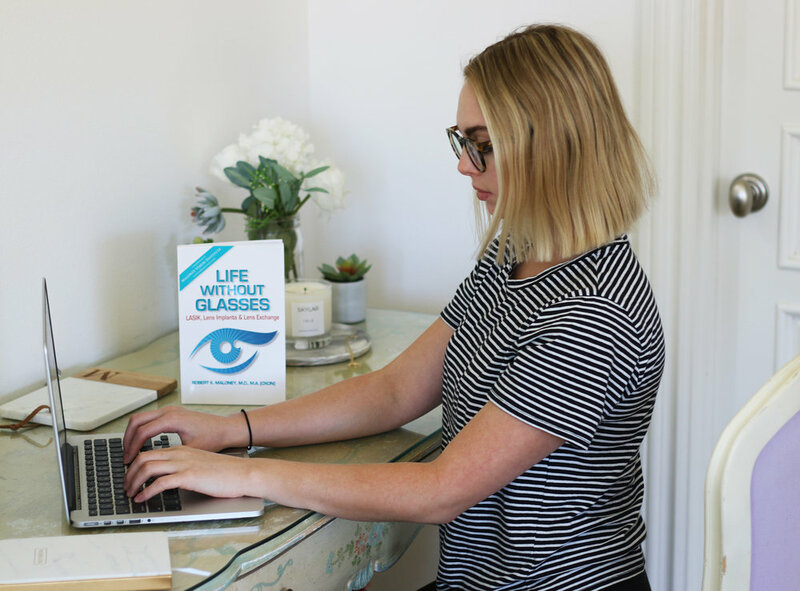 Dr. Maloney had the pleasure of sitting down with Marissa, creator of the popular blog, The Editorialist LA, to deep dive everything you might be wondering before having LASIK. Check out this great read! I’ve always regarded this website as a city guide for ALL things Los Angeles, and while it usually veers towards food, fashion, beauty, events, and the like, occasionally it takes me to places I never thought I’d go. Recently, one of those places was the Maloney Vision Institute on Wilshire, where I received a consultation for LASIK surgery, which might not seem like a crazy thing to do. Except that I have, well, 20/20 vision. But even though I’m not personally a candidate for LASIK (yet), I’ve always been surrounded by the vision-impaired; my parents, my sister, my boyfriend, and many of my close friends all wear glasses or contacts on a day-to-day basis. From their frequent eye doctor appointments to finding the right glasses (which are always expensive), ordering contacts, and dealing with the potential risks of wearing contacts day-in and day-out for years, I’ve sat idly by, witnessing them struggle with their vision problems. Plenty of them have considered getting LASIK, and I’ve always wondered what held them back. So in partnership with the American Refractive Surgery Council, I decided to do a bit of research on their behalf, learning more about this common procedure and the best place to get it done in Los Angeles. On my recent visit to the Maloney Vision Institute, I had the distinct pleasure of sitting down with Dr. Robert Maloney himself, a legend in the field and veteran eye surgeon who’s performed surgery on over 60,000 (!!!) patients. The institute is one of the leading ophthalmology clinics in the city, and they’ve treated countless celebrities, including performing vision screenings on the Dodgers during Spring Training. He thoughtfully explained the whole process to me, from consultation to recovery and everything in between, and I even got to witness a live surgery (which wasn’t nearly as gross as you’d think). His calm demeanor is incredibly reassuring, and I appreciate how much time he spent answering all of my many questions. So, if you have vision problems and have considered getting LASIK Surgery done, what do you need to know? Over the last 15 years, LASIK has become more and more a young person’s procedure; while it used to reign amongst those 40+, the average age has gone down to just 32, as younger generations have seen the benefits of living out the rest of their lives with corrected vision. Dr. Maloney explained that he loves performing the procedure on younger patients, as LASIK is slightly more accurate for them and they have so many more years to enjoy the benefits. While vision correction surgery used to be a more serious undertaking, Dr. Maloney explained that over the last 10-15 years, continual medical advancements have made it safer than ever. A gradual improvement in equipment has helped address some of the potential side effects, like dry eyes, to become more comparable to your average set of contacts. Dr. Maloney compares the procedure to getting braces or Invisalign– it’s not a huge agonizing decision, but a small lifestyle improvement. Though they cannot guarantee 20/20 vision in every patient, 97% of Dr. Maloney’s patients leave with 20/20 vision. With the latest technologies, he now aims to get his patients to 20/15 vision. He wants people to see better than they did with contacts. 4. Are You a Candidate? The best candidates are people with healthy eyes (so no other diseases), who are tired of wearing glasses or contacts. In general, LASIK can correct far sightedness, near sightedness, and astigmatism. If you’re very skewed to one of those things, you might not be a candidate. A good candidate is also someone whose vision hasn’t changed much in 2 years. For older people, the procedure might not get rid of the need for reading glasses, and a cataract surgery might be more beneficial to prevent future issues. 5. What’s the Process Like? Considering this is a potentially life-changing surgery, the process is surprisingly low-maintenance. Patients come in for an initial exam to figure out if they’re a candidate, and there’s a careful test of the health of their eyes; they can even have the surgery that day! Or, they can opt to have it another day if they’re not ready yet. This initial consultation is only 45 minutes to an hour. Surgery is only 10 minutes and virtually painless. Once patients are done, they’ll hang out for about half an hour and then they will need someone to drive them home. They’ll pop a sleeping pill and sleep for a few hours. Later that day, their eyes shouldn’t be in pain and they’ll be seeing better already. There’s a check-up the next day, when they will already be seeing 20/20 or better! By the next day, the patient will no longer need glasses or contacts and they can get back to full activities. The only thing they need to avoid is swimming for one week (no dirty water or germs!). All together, you only need to do 1 or 2 visits, and if you do it all in one day, the whole thing (including the consultation) takes about 2 hours total. The potential side effects are relatively minor and include dry eyes and glare with lights at night. The basic idea of using a laser to correct vision is that it’s like sculpting a contact lens on the surface of the eye. The cornea is an irregular shaped dome, and contacts work by changing the shape of the eye. But they’re plastic, and not perfect, so laser actually reshapes the dome of the cornea. In the past decade or so, they’ve developed measuring systems that are very accurate— the same system developed by NASA– to get the exact measurements of the eye. Though it’s not a primary consideration of patients when receiving LASIK, talking to Dr. Maloney reminded me of all the plastic and packaging that goes into a lifetime of wearing contacts and glasses. Imagine not throwing away plastic contacts, packaging, and plastic frames and lenses. Also think of all of the carbons emitted to produce and distribute all of these products! LASIK, on the other hand, uses a couple watts of energy, which is equivalent to having a lightbulb on for a little while. In a way, getting LASIK surgery is just one more way humans can reduce our environmental footprint. Dr. Maloney challenged me to imagine a world where everyone had perfect vision— imagine all the car accidents we’d avoid. Or if older people had better vision, how that might prevent them from falling and injuring themselves. LASIK offers the opportunity for people to see better and a way to avoid some of life’s smaller daily grievances. He’s had patients come in seeking specific lifestyle changes, like a woman who wants to become an astronaut and can only do so once her vision has been corrected. But most people are just tired of wearing contacts and glasses. Studies have shown that most patients are happier with their vision after LASIK than they were when wearing contacts. They boast better night vision on average because it corrects astigmatism, and are overall happier with their vision quality and life. 10. What Was Live Surgery Like? As someone that can stomach Grey’s Anatomy scenes but is a bit squeamish when it comes to real life medical issues, I was hesitant to witness a surgery firsthand. But if anything, it made me feel that the entire procedure was really no big deal. I honestly couldn’t see that much, just the doctor working a few feet away and a camera fixated on each eye. The worst part was the first time I saw the doctor flip up the cornea, but it really just looked like he was removing a contact from the surface of the eye. The whole thing was incredibly quick, with no blood, no stitches, and no gore.